I was talked into attending the Mineral Wells Champ Tour event. I had no idea what it even was, but there was no conflict with my local events so what the heck. I was looking to gain more experience, meet some more STH folks and have a good time. So a few days before the event I reached out to Thomas Thompson and asked him a few questions. He pointed me to this amazing article here. That was a massive help and really answered most of the questions I had. It did not prepare me for several things which I thought I would share with others. These are not in any specific order but maybe it will give you some things to consider. I got to the event a little later than I had anticipated on Friday or Day 0. I did have time to walk the track, but I choose not to. Why? 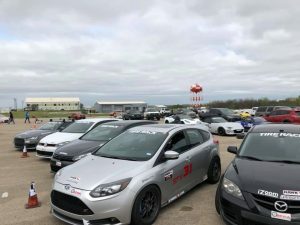 Well the layout was massive, and I knew that being new to autocross there was no way I was going to remember any of it the next morning. Heck, half the time I don’t remember what I was surfing on my laptop the night before. I caught up with Brian Fipps (another STH driver who had invited me to join him for what I was sure was going to be a slaughter). A little background is probably beneficial at this point. I bought a Volkswagen GTI as a commuter car mainly because the cheap power they are capable of making. Also, was a TDI fan and own a few. Autocross came into the picture after I purchased and modified the car. This all started about half way through last season. 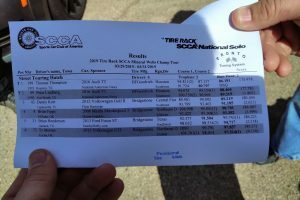 It is a blast to drive on the street, and autocross provided an avenue for me and some buddies to have some legitimate bragging rights (Which I usually own at least locally). Going into the tour, I knew that I am usually at least 2 seconds or more behind Brian and Eric Hunter locally. Either usually wins the STH class and place well in PAX. So, you can imagine my first thought was if I am 2 or more seconds behind on a small track this is only going to get amplified here and it did by quite a lot! I woke up around 4:00 on Saturday (Day 1) and tried to sleep until 6:00 but I was realizing this is “kind of a big deal” and was thinking “What the heck am I doing here?” Eventually I headed over to the event after a quick shower. Meanwhile the weather in TX changed, like it tends to do frequently, and it was windy and cold. I had a 1st heat work assignment and ran in the second heat. I parked the car and hit the track I walked it 2 times back-to-back and I am pretty sure it took about 40 minutes at a good pace. The whole time I am walking it I am thinking this is going to be a fast course. Are my brakes going to make it? Am I going to make it? Will my tires last? All while trying to remember what cones to be looking for next and remember the last gate and where should I be vs where the car will probably be. I forgot to mention all of the amazing distractions there are around. At my local events there are around 50 cars and it feels like over half are Miata’s. Don’t get me wrong, there were Miata’s there but there were so many awesome cars. I talk a lot of trash in general, but the reality is I usually find something to like about any sports car. I don’t know the exact number of cars that were there but probably over twice as many as I was use to. Well, there is no time to take it all in. I had to get checked in for my work assignment and all you pros know where us rookies end up. Yep, I was working Corner 6 which I did not mind one bit except I should have packed a parka and face mask and gloves. It was cold and the wind was blowing 30 to 40 mph which I think helped and hurt all those light Miata’s! During heat 1 runs I tried to watch as much as possible, but I was nominated to write down all the cars numbers and cones etc. I believe this is the “audit” job. Unfortunately, this meant I was more focused on the car class and number vs where they were or what they were doing. Butterflies were starting to build up by this point as I knew it was just a matter of time before I would be out there dodging those orange bastards while they laugh at me in my side mirrors! (The cones not the corner workers). Heat 1 wraps up and I run straight to the restroom and then straight to my car which was at the far end of the lot. Did I mention this place is huge! I get up to grid, find my grid spot and successfully wedge myself between 2 other cars. Grid spots were way too tight. Just when I opened my door the wind picked up and, yep, you guessed it. I tried like hell to catch the door, but it was too late it had already kissed the car next to me which was a VW Golf R of course! I apologized to the owner and told him I will gladly pay to have it PDR’d. He was about as cool as one could expect to be. After that we tried to push the cars down a bit and stagger them to avoid this moving forward the rest of the day. Things are starting to go downhill quick and I have not even made it to the starting line! A few minutes later the grid worker comes by and says 5 cars! I jump in get my helmet and check a few things. I pull up to the starting line as I watch the others in my class take off. The starter gives me the wave and off I go at this point there is lots of doubt, so I am throttling out for sure! Remember it is cold and so are my RE71R’s so I really go nowhere quick. After making the first turn and heading down the short straight. 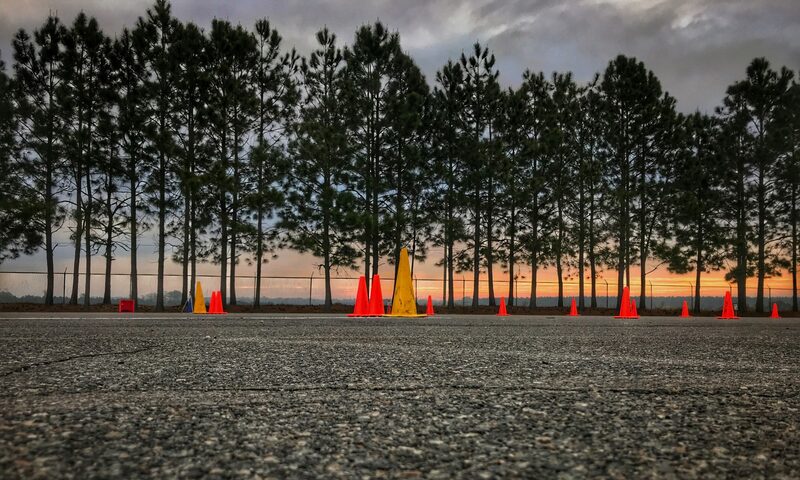 I am so focused on the next turn that I completely missed the optional 3 cone slalom and by optional I mean you can go left or right but you still have to actually do the slalom! Approaching the next corner I realize I started with a DNF and then I realized I still needed to drive at a decent clip because I knew that Audi TT was going to be all over me with AWD. At this point I should have been pushing extra hard as it really did not matter however, I found my mind wandering and also upset that I blew it right out of the gate! Needless to say, my time was 6 digits vs 5 like most others. I finished my first run knowing I had significant time to make up. My second run was a vast improvement however nowhere near anyone else. I made more improvements on my 3rd and final run of the day but still far from where I should have been. In between runs I watched other’s, but it is hard to judge speed and really see lines from a distance. I was able to get a few glances at some Solo Storm data that provided some insight as well. So off to get a bite to eat and relax for a few in the car while staying warm. I wandered around and ended up joining some great people for dinner that showed me what this sport is all about. really going to push the car and if I take out cones well, I take out cones.” In reality, I think I hit one cone over two days. Maybe I am not taking the right line in fear of hitting cones or maybe I am still not pushing the car to the point where I take out cones. Either way, I ran my three runs and kept pushing shaving time off each run but still in last place. 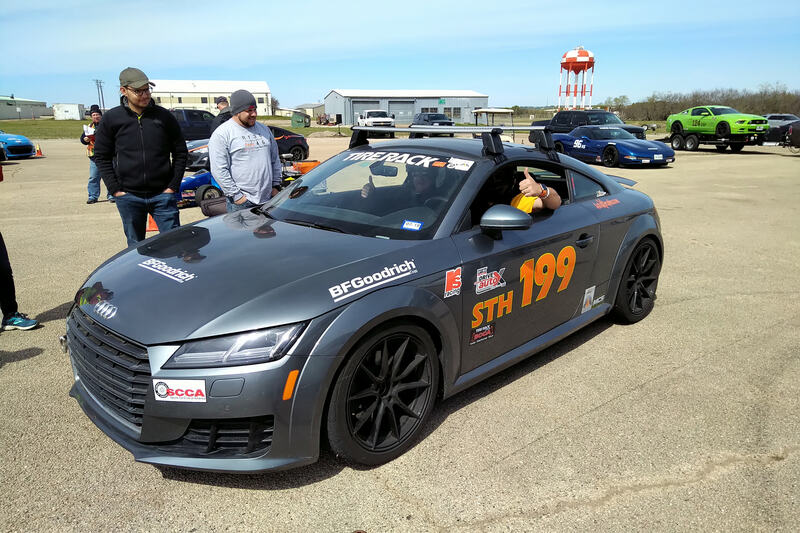 I am not going to lie I am not usually intimidated buy the size of the course and the guys I was running with certainly had me second guessing my autocross future at least at a national level. Then something magical happened. Thomas Thompson was in a position that he could take the disqualification and still win the class. So he offered to let me ride along with him or drive my car on his last run. 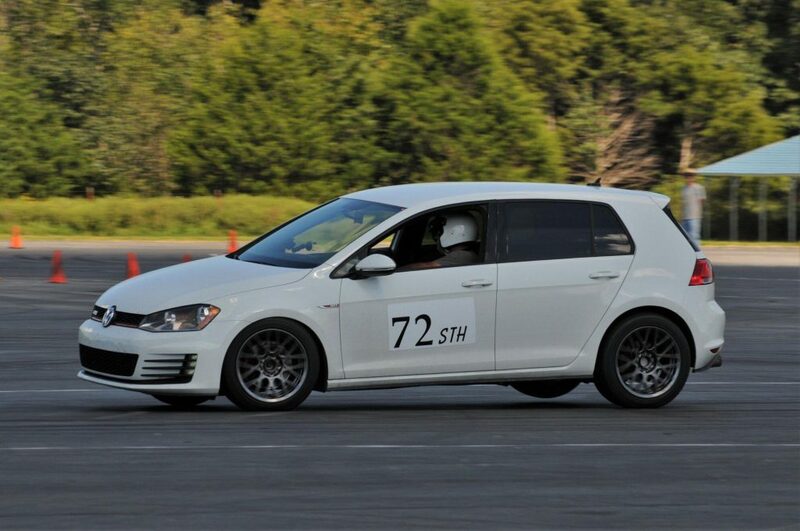 Don’t get me wrong I love my GTI but I knew it was no where near the class limits from a modification standpoint. So that decision was easy and it was the best decision I made all weekend! I was really a little uneasy with the offer but after he explained the situation I was on board. Let me just say to all the experts and veterans in the sport the best thing you can do is let the new guy catch a ride with you. I would actually go as far to say that one of the best things a club can do is find a way to offer this to all rookies and novices. Not everyone is comfortable asking to ride along especially with the faster guys at their local events. So find some way to make it easy for them to have this opportunity. The reality is that I remember that run better than any of my own runs and I believe that is a good thing. If I can just find some way to pull that run up from my memory and start to apply some of the techniques it will be a huge help. I ask for rides all the time at my locals and I ask the guys that are way faster than me for a reason. It is too bad that there is not an opportunity for this to happen at a national level without a penalty because I believe there is a big difference between a 30 to 50 second course and a 75 to 100 second course not to mention the talent level that shows up. For all of you that might disagree or think that people should race locales for several years and then attend MidDivs. I have one-word contingency! I am totally fine with where I placed, and I know that by participating I helped increase the potential earnings plus helping to grow the sport. Plus with all the new guys showing up we get to work the course for you! So would I do this again? Absolutely! I was just looking to see when and where the next big events are at. I might be heading to Mississippi in the near future! I hope as fellow novices you don’t let people discourage you from attending larger events. There is no reason you should not attend the next one that is close to you or make it a road trip and go visit a new city. Just make sure you have a great time and make some new friends along the way. 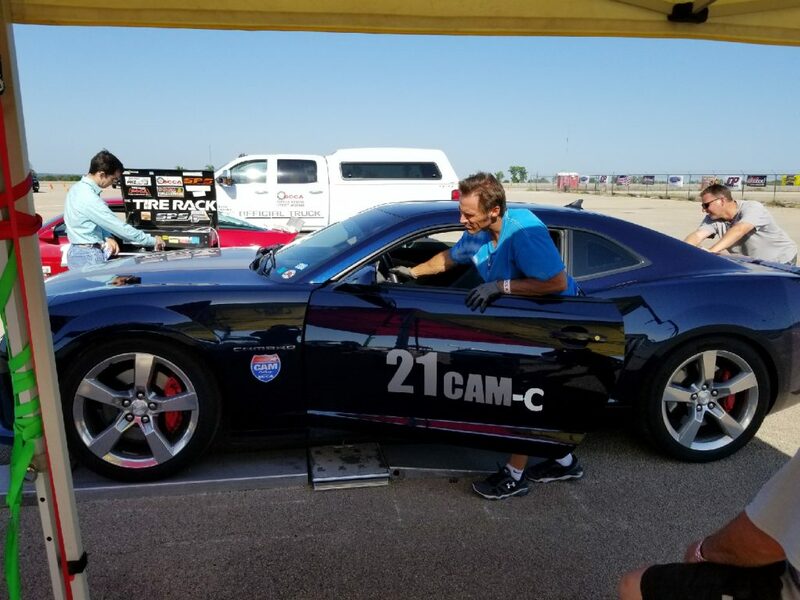 It was a last-minute decision to attend the CAM Challenge in Mineral Wells, Texas. I went from excitement to “What in the heck did I get myself into?”. 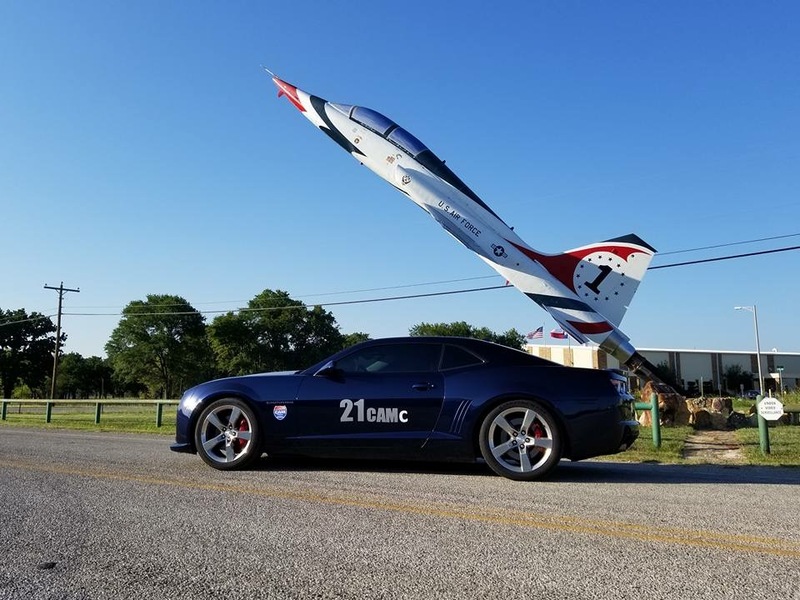 To give you a little background, I own a 2011 Chevrolet Camaro 2LT/RS. She is my drag racing car (with nitrous), my autocross car, and my grocery getter. Her suspension work has been upgraded to a 1LE Track Pack, as well as, Brembo Brakes and stainless-steel brake lines (all work was done by J-Rod’s Speed Shop in Richmond, Texas). She turned 118,000 miles on the way to the Mineral Wells! Going in I knew I was an underdog, being 2 cylinders short with my V6, but the experience I gained was well worth the trip! As I arrived on site, I saw most of the vehicles were trailered in. At this point I knew I was playing with the big boys and girls. I headed straight to registration. Being my first event, I wasn’t sure exactly how everything worked and they were very helpful. I received my stickers for my helmet and my car and I went to get my car ready for tech. I headed to tech, and this was the most involved tech I had ever been in. My car got weighed! She weighed 3,706 pounds without me in it. The tech crew was also very helpful. After my tech, she was good to go! Fast forward to the first morning of competition, this is where my butterflies started kicking in. Luckily, my group CAM-C, had to work first. This would give me time to calm down and watch the other drivers on the course. The first group staged in the grid, and for our group we did a pre-grid. This allowed the transitions to run smoother. Then it was off to work. Let me tell you it was so awesome watching these cars run on the course! Then it was our turn to run. We get staged in the grid, and you have spots already assigned where you were supposed to park. 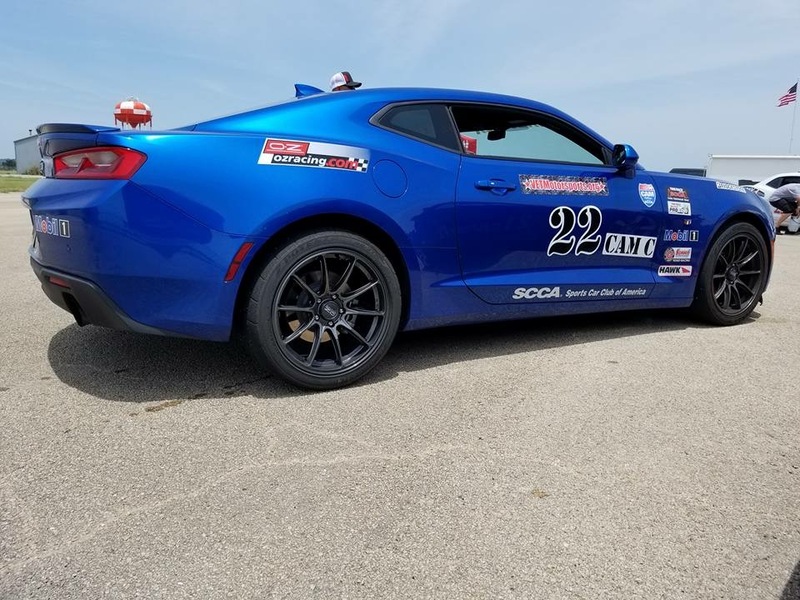 I was lucky enough to be staged next to the VETMotorsports SCCA sponsored 2017 Chevrolet Camaro. This is where I meet Pete Cline from VETMotorsports. VETMotorsports is an award-winning, non-clinical outreach program that honors and empowers veterans with service-related injuries through active participation in motorsports. He was there with 2 veterans. Let me tell you it was a pleasure to hear about their program and be able to race alongside these veterans. My first day of racing went well. I found that I wasn’t running the right type of tires, so the course felt very slippery to me. After the competition that day, we were fortunate enough to have time for some fun runs, so I took advantage of them. Everyone during the day was very nice and helpful. It was really hot that day, so after the awards and the sponsored dinner I went to the hotel to pass out. Sunday morning comes around, and I’m exhausted. You don’t realize how much the heat can affect you. This is the day we are racing to get qualified for the runoffs. 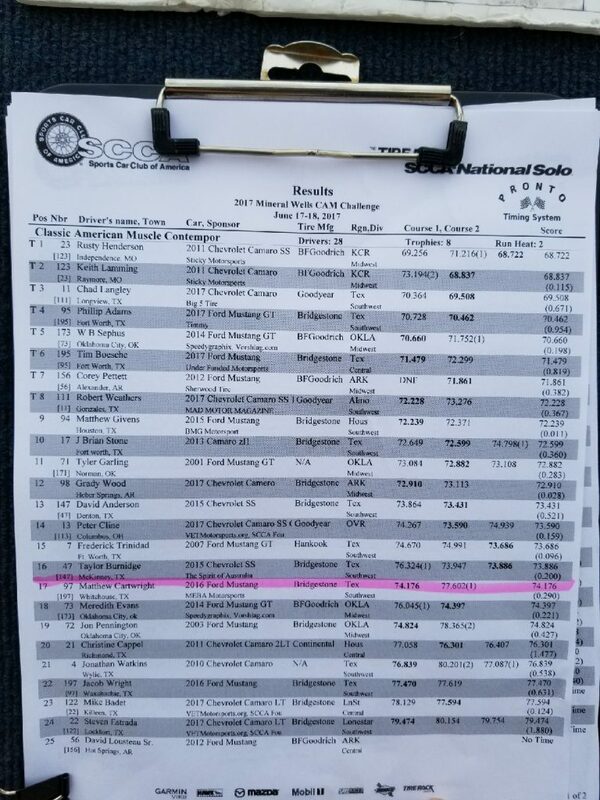 My times were better than Saturday’s but I was only 1 short of making the runoffs after a few people dropped out. I was slightly bummed, but I knew I wouldn’t make it far in the competition. I definitely learned a lot, and I met so many nice people! I look forward to competing again in the national events. With my car being a daily driver and with 99% of the cars being dedicated race cars; I was extremely happy with how I placed in this event. My fastest time was 76.301 and it was done with my traction control on and Continental tires! For some reason having my traction control off my times were worse. This may have had something to do with not having the right tires, but I still had a blast racing! I had a lot of support from my family and friends over the weekend, and I again want to thank J-Rod’s Speed Shop for my awesome setup, and well as keeping her in tip top shape for racing.